90s OVERLOAD – Sweet, rock and a whole lot of bold, the 90s were an era of statement making music that shook the core and revitalized Philippine music. 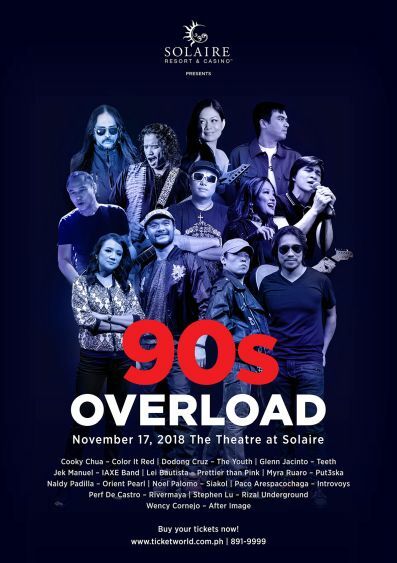 Hear the pulse raising hits all over again in 90s Overload happening on November 17, 2018 at The Theatre at Solaire. The concert will bring together the 90s most iconic band voices to sweep its audience onto its currents. “Everyone knew everyone and supported each other’s music. Though we had our own unique sound and identity, we were all part of one community, one family, one barkada,” says Prettier than Pink’s Lei Bautista. The era’s richness in musical material that spoke to one in a personal level made it difficult for most to pick which they would consider as their 90s anthem. But for some, there are songs that are more long-lasting than others. Asked what they’re looking forward to in their upcoming concert, the four artists gave the same answers. “We want to bring back the audience to the 90s and recreate the same energy and atmosphere while we get to hang out with old and new artist friends, says Lei. Concert goers will definitely witness a big jamming session of their favorites 90s anthems that will make them unconsciously bob their heads, sing along, and jump up from their seats. For tickets to “90s Overload”, you can call TicketWorld at 891-9999.